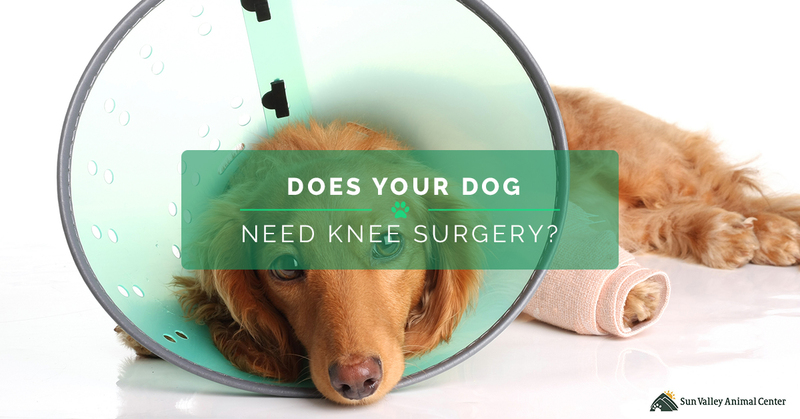 Pet Surgery: Does Your Dog Need Knee Surgery? Do you think one of your dog’s legs has gone lame? Has your pooch torn or ruptured their CCL, or cranial cruciate ligament (which is similar to the ACL in humans)? In more detail, the CCL is what connects the bone right about your dog’s knee (the femur), to the front of the bone below the knee (the tibia). The CCL is responsible for stabilizing the knee joint and keeping the tibia in the correct place, below the knee. However, if your dog has torn or ruptured their CCL, it’s likely they will have no use of their hind leg, and unfortunately, breeds, ages, activity level and obesity all play vital causes. What are the symptoms of a torn CCL? Most commonly, dogs experience torn CCL or orthopedic problems. And, depending on the severity of the CCL or orthopedic injury, your dog may be unable to bear weight on the injured leg at all, or they may have just a hint of lameness; it varies from dog to dog. However, there are indicators that your dog may have torn their CCL, and this is called the “drawer sign.” When you make an appointment with your local veterinarian, they will hold your dog’s femur in place and move around the leg. If the dog’s tibia moves forward while the femur is being held in place (like a drawer, hence the name), your dog may have torn their CCL. Schedule a Pet Surgery Consultation Today! Along with the physical exam, x-rays may be taken to learn if your dog’s knee has more damage than anticipated. X-rays will help your veterinarian to determine whether or not the knee bone was damaged when the ligament was torn or ruptured. What breeds are more prone to CCL tears? Don’t think that your dog is excluded from the list even though their breed isn’t susceptible. There are other causes of a CCL rupture, including obesity. Animals that don’t get enough exercise that occasionally experience strenuous exercise, also known as “weekend warriors,” tend to develop CCL injuries more than other dogs. Sometimes, a slight misstep is to blame for a CCL tear. According to Pets.webmd.com, studies show that 5% of males neutered before 12 months and 8% of females developed CCL injuries later in life. Also, studies have shown that about half of the dogs that rupture the CCL on one leg will develop the condition in the opposite leg. What is the treatment for a CCL? If left untreated, your dog may not be able to use their injured leg at all. It’s highly recommended by most veterinarians that you call an experienced pet surgery center, such as Sun Valley Animal Center in Boise. We have a wide experience of pet surgery and can give your dog the care they need when they need it most. To learn more about a CCL pet surgery, contact us by calling 208-726-7777 now.